The Frigidaire 14.8 cu. ft. Chest Freezer offers more storage so you can stock up on frozen foods. Take organization to the next level with our heavy-duty sliding plastic baskets that can be used to organize items by categories or purchase date so items are much easier to find and the Exterior Dial Temperature Control is easy to reach and operate. White with smooth steel exterior that is easier to clean and offers a clean, modern look. This product contains a chemical known to the State of California to cause cancer, birth defects or other reproductive harm. For more information, go to www.P65Warnings.ca.gov. Is this an energy star appliance? Does the freezer lid hold its position when open, or does it require you to hold it open by hand? If it retains its position on its own, at what angles / degrees does it do so? Hey Brian. The community is not steering you wrong. The green light on the front is an power indicator light. They are included. Easy to install. 14.8 cu. ft. 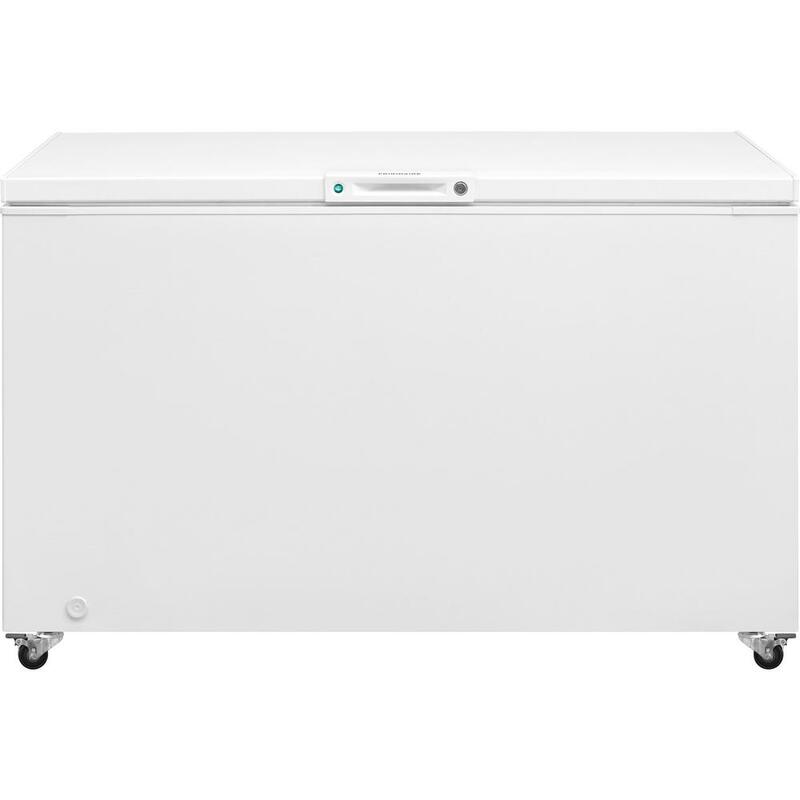 Chest Freezer in White is rated 4.4 out of 5 by 301. Rated 1 out of 5 by AnnieInSoCal from I purchased this freezer approximately 8 months ago at Home Depot. At first, everything seemed t... I purchased this freezer approximately 8 months ago at Home Depot. At first, everything seemed to be fine...and then... With the green light still on in front, the freezer totally died. I didn't realize it until I opened it, and the odor was so bad I had to leave my home for several hours. I contacted Frigidaire, and apparently I'm not in a region in which I can receive help, so Frigidaire emailed me a letter, offering to buy the freezer back, less tax, and less any delivery fees. This leaves me not only out of pocket for tax, etc. paid, but I'm also out the cost of perished meat, as well as getting this freezer hauled off and taken to the dump! This is the worst example of warranty customer service I have ever encountered. I called again today and spoke with an "Electrolux" supervisor (manufacturer of Frigidaire products) and received no further help. I live alone, I cannot handle this bulky, festering freezer by myself, and this is not a satisfactory resolution for an 8 month old freezer than I saved up for, and paid over $400 for. Beware before you purchase, and Home Depot, please consider choosing manufacturers who do a lot more to stand behind their customers, this is utterly unacceptable. Rated 4 out of 5 by azrob from Freezer got to correct temperature in a short time. Delivery was prompt. The size is great for us... Freezer got to correct temperature in a short time. Delivery was prompt. The size is great for us. Like the casters, we are using in garage so nice to have some mobility. Only downside so far is that you really need to make sure you close the top forcefully to create a seal. We did have some frost develop on back top inside because of inadequate closing. Rated 1 out of 5 by TeamV from Failed after 4 months, solid customer service Just like the title says. Bought the unit in Nov, it just failed the other day. Never lost power, all the lights on, no tripped breakers...unit was warm inside and meat was thawing fast. Thankfully we caught it. Was working at 10pm the night before but somehow broke by 8am.The customer service experience was surprisingly helpful. No complaints there. Rated 1 out of 5 by TomInNH from I am disappointed that the lowest rating I can give is a "1." This 'freezer' certainly deserves ... I am disappointed that the lowest rating I can give is a "1." This 'freezer' certainly deserves a ZERO! I purchased this "freezer" 24-hours ago. Brought it home, attached the casters, leveled it out, and plugged it in. Waited 4-hours to see if I could start transferring food from my broken freezer to this one. No! This "freezer" was not even slightly cool. After 24-hours, the "freezer" is still hot as outside temperature. Called tech support to schedule emergency service. Was informed that emergency service was NOT a service Frigidaire provided. Was further advised that "there are no service techs in my area, and that a repair ticket had been submitted and someone would be calling me in 3 business days." Three business days?!? My food from the old freezer is melting. not sure if I will be able to salvage any of it. But that is okay, a tech will be calling me in THREE business days! I would NOT recommend this "freezer" to anyone at Home Depot, or anywhere else!!! Rated 5 out of 5 by Joanne from We love the fact that this has the option of adding casters! SO simple, but so handy! And, the ... We love the fact that this has the option of adding casters! SO simple, but so handy! And, the fact that it tolerates the cold and can be placed in a garage without breaking down over winter is great. That's what took the life of our last chest freezer, and I am relieved to know that shouldn't happen again with this one. Rated 4 out of 5 by Geyservilleman from It was the best priced value for the size and... It was the best priced value for the size and seems to work just fine. We’re planning on using for hunting meat and extra storage. Rated 5 out of 5 by HomeDepotCustomer from The only thing to assemble was to put on the... The only thing to assemble was to put on the wheels. Rated 1 out of 5 by MrEd from BRAND NEW AND NEVER WORKED! ... BRAND NEW AND NEVER WORKED!